If you would like to see the newly discovered species of octopus which may be named “Opisthoteuthis adorabilis,” you have to dive in the Pacific between 200 and 600 meters. You will surely feel cold with only 6 degrees Celsius temperature in there. An appropriate name for the mysterious fist-size pink octopus is being brainstormed in California. The researchers found the octopus adorable though little is only known about it. According to her study, the octopus spend most of the time on the bottom wherein the water is cold sitting on the sediment and they also need to move around in order to find food and partners. A batch of octopus eggs is being incubated in Bush’s laboratory and she found out that they develop very slowly. In fact, they may not hatch for two to three years. When netizens have seen the image of the flapjack octopus photographed 1,080 feet below the surface of the Monterey Bay, California, they cannot help but give their admiration to its adorable looks. 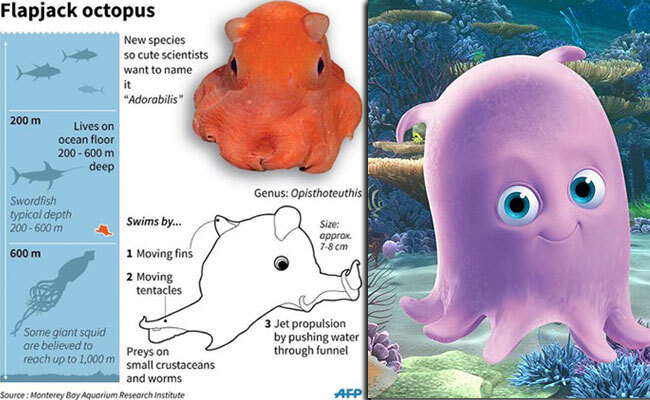 What can you say about the new octopus species? If given a chance to suggest a name, what is it?